Key Features: • Seven npn Darlington pairs • -55°C to 125°C ambient operating temperature range • Collector currents to 600mA • Output voltages from 50V to 95V • Internal clamping diodes for inductive loads • DTL, TTL, PMOS, or CMOS compatible inputs • Hermetic ceramic package The SG2000 series integrates seven NPN Darlington pairs with internal suppression diodes to drive lamps, relays, and solenoids in many military, aerospace, and industrial applications that require severe environments. All units feature open collector outputs with greater than 50V breakdown voltages combined with 500mA current carrying capabilities. Five different input configurations provide optimized designs for interfacing with DTL, TTL, PMOS, or CMOS drive signals. These devices are designed to operate from -55°C to 125°C ambient temperature in a 16 pin dual in line ceramic (J) package and 20 pin Leadless Chip Carrier (LCC). 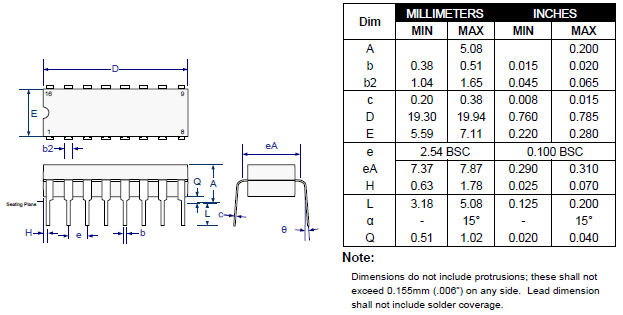 The plastic dual in–line (N) is designed to operate over the commercial temperature range of 0C to 70°C.